One of the hardest things about giving up wheat or going gluten-free is foregoing comfort food. When I was diagnosed with celiac – disease in 1995, I craved pizza. I longed for muffins, and cookies. But the tiniest molecule of wheat gave me hours of running to the bathroom, burning stomach pain, and exhaustion. In the 30 days of cooking from scratch challenge (#30fromscratch), many of the participants are avoiding wheat or gluten in their food. For some its a health mandate, and for others its by choice. If you are one of those people, I’ve got some good news. I’ve recently discovered coconut flour — a low carb, high fiber alternative to wheat flour. While, like all gluten free substitutes, it lacks the structural integrity of gluten, it performs better for me than many starchy substitutes. It also does this without adding a significant carbohydrate wallop to your low-glycemic, or low carb diet plan. Coconut flour varies according to the source and maturity of the coconuts that it is made from. It is the by-product of coconut milk production. Thus it is mostly fiber, with a small amount of protein, and fat — most of this being extracted with the coconut milk. You actually can make it at home, by making coconut milk from dried coconut flakes. Extracting the oil and milk well by pressing. Then drying the pulp and grinding it in a Vitamix or food processor. Because coconut flour is not a starch, it has its own rules when working with it. It absorbs a lot of liquid in your recipe. Allow the coconut flour batter to rest for at least 15 minutes before adding more flour. Too much flour will make your baked goods very dry. A light, gluten-free, bread that is perfect for snacks, serving as dessert, or enjoying with afternoon tea. Mix eggs, coconut flour, flax seed, honey, and coconut oil together. Beat well. Allow the batter to rest for 15 to 20 minutes. It should be the consistency of a thick muffin batter. Add more flour if it is too liquidy, 2 tbsp. at a time. Allow to rest for 10 minutes between additions to allow the coconut flour fully absorb the liquid. Add salt, baking powder and dried cranberries to the batter. Spread in a greased bread pan, about 3/4s full. Place loaf in the middle of the oven. Reduce heat to 325F and continue baking an additional 15 to 25 minutes until centre is done and top of loaf is golden brown. Mix eggs, coconut flour, flax seed, honey, and coconut oil together. Beat well. Allow the batter to rest for 15 to 20 minutes. It should be the consistency of a thick muffin batter. Add more flour if it is too liquidy, 2 tbsp. at a time. Allow to rest for 10 minutes between additions to allow the coconut flour fully absorb the liquid. Add salt, baking powder and dried cranberries to the batter. Spread in a greased bread pan, about 3/4s full. Sprinkle coconut on top. Place loaf in the middle of the oven. Bake for 30 minutes at 350F. Reduce heat to 325F and continue baking an additional 15 to 25 minutes until centre is done and top of loaf is golden brown. Don’t over bake. The loaf is high in fiber, and very filling. There is a light coconut fragrance when it first comes out of the oven but there is no coconut taste in the finished baked goods, unless you add additional coconut to the top. For those foregoing gluten or wheat based baking, coconut flour offers comfort, convenience, and the pleasure of eating baked goods without the trauma. If you are allergic to eggs, coconut flour might not be the best choice. Guar gum or xanthan gum are often used to give structure in gluten-free flours. I haven’t tried using guar gum instead of eggs with coconut flour. Adding apple sauce or other high in pectin fruit might increase the structural integrity of coconut flour and allow you to reduce the number of eggs used and the amount of sweetening. It’s on my list of things to try. Tropical Traditions is partnering with Joybilee Farm to offer an awesome baking basket giveaway to celebrate our 30 Days of Cooking from Scratch Challenge. The basket includes one 32 oz. jar of Tropical Traditions Virgin Gold Label Coconut Oil, one 2.2 lb. (1 kg.) package of Tropical Traditions Organic coconut flour, one 17.6 oz. jar of Certified Organic Canadian Wild Honey, One 32 ounce jar of Coconut Cream Concentrate, and one 1 lb. bag of Tropical Traditions organic coconut flakes. The draw is open to residents of the US and Canada only. (Sorry international readers.) Canadian winners will be responsible for any duties or taxes incurred when the box is imported into Canada. Tropical Traditions is the brand of Organic Virgin Coconut Oil, coconut flakes, and coconut cream concentrate that we use at Joybilee Farm. Organic Virgin Coconut Oil is an amazing healthful, cooking oil that I use for all my frying, and much of my baking. Find out more about cooking with Virgin Coconut oil here. The Giveaway ends on June 30th at midnight. Enter now. on Virgin Coconut Oil, and I will receive a discount coupon for referring you. Thanks for your support. Thanks for the info. On using coconut flour. Can’t wait to use it. I have been dying to try some recipes that call for coconut. My son and I have allergies to all grains but rice. Yumm, Paleo treats! baked goodness. My family loves baked goods, this basket could lead to some wonderful new, healthy breads! I love making desserts with coconut oil! I would experiment with all of the different recipes from the coconut oil cookbook I got for my kindle. I give Tropical Traditions pet coconut oil to my dogs. It’s a wonderful way to make sure they’re getting enough oil in their diet. I’ve never used coconut flour, but I would like to try it. The first thing that came to my mind was pancakes and I’m not really a pancake person. Skimming thru the other posts there’s so many good things to try that others have mentioned. I’ve never used any of the Coconut products because I’m not a fan of coconut but am becoming more interested in trying them. Desserts! These ingredients look so yummy. I would so love to try some of these products! My daughter is gluten-free, and wants to start her own bakery business. I would love to win this for her to help her out. I think I would try macaroons for my husband. The Cranberry Quick Bread looks and sounds delicious. I’ll definitely be making it! I am wheat free but also low carb, so excited to try coconut flour! I would love to make a delicious baguette style bread for french toast. Hmm after reading your post I am wondering if this is our problem in the family. I have some flours here that are gluten free and need to learn to use them. DH and daughter complain of stomac pain but I was thinking it was dairy… now I am wondering. Were ok with eggs so I cold use the coconut flour here. Trying cocunut oil now in my cooking – would LOVE to try my hand at ANY baking project! I’m not on the #30fromscratch, but I wish I was! We had hot dogs the other day and everyone in the house got sick! I’d love to hear about your experiences cooking with coconut cream. It’s a new product to me but I love anything coconut. Great blog! I’d love to see if I can adapt my pumpkin bread recipe. My husband is diabetic, so baking has been missing from our kitchen. I would love to try some new items to see if I could bring back something I love to do and enjoy. awesome. I substituted xylitol for the sugar. My family and I have almost eaten the whole pan already. Definately a recipe to keep! I would love to try the cranberry loaf!! Yum, banana bread followed by your yummy looking brownie recipe. I have been wanting to try some of these products for a while, it would be great to win them!! Yum! The brownie recipe looks delicious! We are gluten free and I am entering the world of baking with coconut flour and so far what I have tried is pretty good! I’ve only been gluten free for a month and am finding it depressing, especially when it comes to sweets. I’d love to try some coconut flour brownies! I have only just started using coconut oil and I love it. Getting a. chancd to try other coconut products would be great! I would like to make the brownie recipe you recently shared! Just found out how bad our ‘wheat’ is now and we have decided to try many different types of flour to change our intake levels. We use coconut manna and oil in many things, I never thought to use the meat of the coconut as a flour substitute. I cannot wait to make food using this and cutting out more and more common wheat out of our diets. Thanks! I would start my adventures into gluten free baking for my autistic son. Maybe do the gaps diet with him for a while. Definitely baking your cranberry quick bread! Thanks! I would definitely try some of your dessert recipes with the coconut flour–mainstream carbs and sugars are my major downfall on the path to good health, and I would love to try something new, but I feel that my budget won’t allow the experimentation at the moment. I would make some breads and would like to experiment with peach cobbler! I would bake banana bread with chocolate chips! I love using coconut flour in banana bread! We love it all, make bread for my husband with very low carbs for the atkins diet. These brownies would be the first thing I make. Just started using coconut oil yesterday and am looking forward to trying things with coconut flour! I have never used Coconut flour, but it sounds intriguing! thanks for the give-away! I would LOVE to get this basket! I use coconut oil for everything from personal care to cooking! I can’t wait to experiment in the kitchen with all the new products! I miss having fresh bread since my husband gave up grains. I would love to have some recipes and resources to try. So much of our eating used to include grain based items; pizza, breads, sweet treats, etc. Thanks for hosting the giveaway and giving someone a chance to try something new. As a mother of 2 children with celiac disease, I so get it. Great tips for using coconut flour which is a staple in our home. I’d make coconut brownies with a honey buttercream chocolate frosting! I would love to make brownies and banana bread! I am looking forward to learning how to use the coconut products! Would love to try a banana muffin or some kind of pancake. The Cranberry Quick Bread looks good too. I wish to try the brownie recipe, I have a weakness for chocolate. I have never used coconut flour. Something yummy…been making coconut & flax seed bread plus flax seed & coconut flour crackers for a family member who is on a low carb diet. I love coconut oil, but have never tried coconut flour. I’m intrigued. I love coconut and am anxious to try coconut flour…hearing that it has the most fiber of all the flours ?? I would make a breakfast bar, easy to take with me, on the run, my lifestyle!! Thanks. I can’t wait to make the yummy moist gooey brownie recipe!!! One I made in the past from a pkg recipe was way too dry, yours looks amazing. Although I can’t eat sugar at this time, my husband has been asking for a nice chocolate treat and it has been months since I baked something nice for him. I can’t wait to surprise him and he can take some to work to share with others that bring nice treats occasionally. I would try your bread it looks yummy! Oh so many yummy things to make, it’s too hard to choose just one! I would make Gluten Free Brownies. I have been wanting to get into baking more with coconut flour! I love, love, love the Tropical Traditions coconut oil too! I am looking forward to making bread and pizza dough! I would love to try baking with coconut flour!!! I think your recipe for the cranberry bread looks wonderful – I think that is what I would make. Sort of try it out so I can perfect it for the holidays. I am allergic to wheat – it gives me terrible earaches! Coconut flour would be new for me so I would need to practice lots! YUM! I wold like to try making banana bread with coconut flour. Have already begun using the coconut oil and I love it. I heard the other day that coconut oil is good for a sunscreen. i would make a recipe i found for coconut energy balls. I use coconut oil for everything! Can’t wait to try coconut flour!! Their coconut oil is fantastic! I would love to try coconut flour! I already love the oil! Although I’ve not been told to quit eating foods containing gluten I am trying to cut back on them because I understand gluten can cause inflammation in the body and can aggravate some chronic illnesses like Rheumatoid Arthritis. I’d love to win this gift basket in order to try out my baking skills with a gluten free product. I love your coconut oil, but I’ve never used coconut flour. I would use the coconut flour to make chocolate chip pie and many other goodies! Thanks for offering the giveaway. Have been wanting to try coconut oil and coconut flour since I first heard about them. Thinking some banana bread would be delicious! I am learning to cook and my husband is teaching me – I know, at 52 it’s about time!! Well, the kids are all out of the house and it’s a good time to learn! I’d love to win!Yum coconut!Perhaps a cake or loaf. I have heard many good things about products from coconuts; flour, oil, milk, etc, and I’m excited to start using them in my cooking. We are also slowly removing gluten from our diets, so because I’m new to all of this, I think that I would be safe and bake your Cranberry Quick Bread. I LOVe coconut oil. Have used coconut flour and sugar on occasion. Love the health benefits, even in baked goods. I’ve made a coconut flour cake in the past that was awesome. I love coconut oil & have wanted to try out coconut flour! Winning this would be such a blessing! I use their coconut oil nearly daily and have their shredded coconut pieces “at the ready” to add to all sorts of things. I think I’m interested to do more with the oil, like toiletries and beauty items. I love Tropical Traditions and I’ve used their coconut flour to make a raspberry cake I took to a church group and they loved it. My Daughter has Galactosemia and can not have dairy, so coconut products are a blessing! I can’t wait to try this. I adore cranberries! I love trying new things and recipes to help myself be healthy. We’ve made coconut flour brownies that were great. Coconut flour doesn’t taste like coconut. Thanks for experimenting for us! I love coconut, I used to buy whole coconuts as a child with my allowance ( my sisters and brothers would buy candy) and hoard it. I am going to try my hand at a coconut cake with coconut cream whipped for an icing, sprinkled with a layer of fine coconut. That sounds yummy. Let me know how the icing turns out. I haven’t tried whipping coconut cream yet. I am excited to try this recipe! Thank you! I’ve got a recipe for raspberry scones I’m just dying to try. I hadn’t thought of the pizza crust. I’m wondering how tortillas would turn out. We have some gluten issues in our family, and are beginning to experiment with different flours. Banana bread is something else that would probably turn out well, with the high moisture content of the bananas….would be fun to try. Thanks for teaching us about coconut flour…thanks for the entire series on cooking from scratch! We’re having fun learning! I LOVE Coconut Cream Concentrate–I substitute for half of the PB in PB cookies and it’s delish! Love Tropical Traditions but out of my price range right now … and would love to try the coconut flour … Thank you Chris! That’s an awesome idea to substitute pb with coconut cream. And coconut is so good for you. I’ll have to try that. I’m interested in trying the Cranberry Quick Bread. I would love to try your cranberry bread, plus a pizza crust recipe I found using coconut flour. I would also just love to experiment and try many different recipes that I miss that use regular flour! I use coconut oil already, but have have never seen (or noticed anyway) coconut flour. I’m excited to try it now and experiment with it. Thanks for the I formation and inspiration! 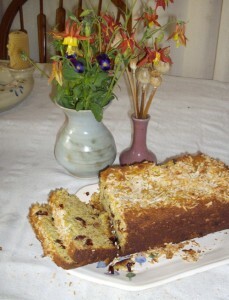 I’d like to try my friend’s recipe for Coconut Cake (original recipe calls for coconut flour). Thanks Chris for the wonderful information. I can’t wait to give it a try. I would make some kind of bread. I would bake something old ( I have been making macaroons since I was little ) and try something new like Chris’ cranberry coconut flour loaf. I would make pizza and a birthday cake. Thanks! I would first try your recipe for Cranberry Quick Bread. I would love to win this gift basket. I am new to using coconut oil and am excited to learn and try so much more. I would love to try making zucchini bread with coconut flour and coconut oil.